In the 1800's, Moldovan territory was annexed by the Russian Empire, only to declare its independence in 1917 with the collapse of the Russian Empire. Upon independence, the flag that was flown was a horizontal tricolour of light blue, yellow, and red. In the centre is a shield with a bulls head. 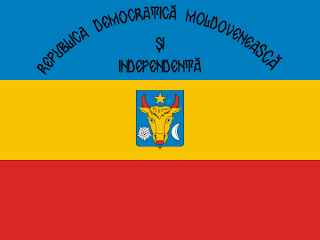 Over the shield is written "The Independent Democratic Republic of Moldova." Very soon after independence, Moldova voted to unify with the Greater Kingdom of Romania. Moldova and Romania shared a long history, with the peoples sharing a common history. However, Soviet Russia did not recognise this move, and finally, in 1940, issued an ultimatum to Romania to hand back the territory. With Nazi Germany's moral support, the Soviet Union moved in, and re-established control over Moldova. The Moldovan SSR adopted a new flag. Like all the other SSR's, it took the Soviet banner of red with the golden hammer and sickle, and the letters PCCM placed above. 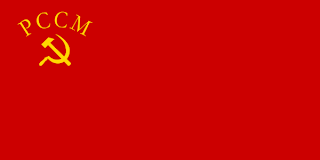 Then, in the 50's, in line with many other SSR's, they adopted a new flag. This removed the text, and placed a green stripe running through the centre of the flag, horizontally. 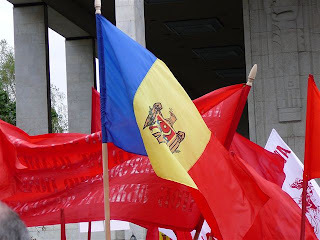 Finally, with the ending of the Soviet Union, Moldova became independent once more. And with independence, a movement began to push for unification with Romania. This led to Moldova's eastern province to declare independence from Moldova. This province being predominantly Russophone, and not wanting unity with Romania. 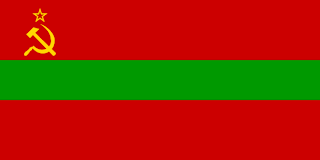 Transnistria adopted the Moldovan SSR flag, removing the hammer and sickle. 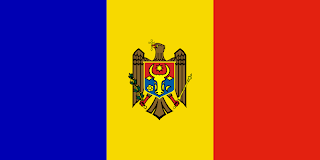 Moldova adopted its national flag in 1990. 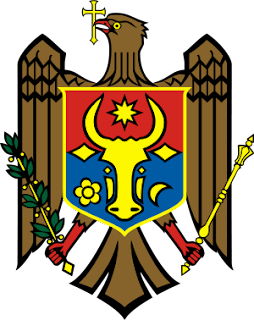 Taking the Romanian tricolour, Moldova placed its national coat of arms in the centre. The Romanian tricolour of blue, yellow, and red, is to show a common history of the Romanian and Moldovan peoples. The eagle is grasping a cross of orthodox Christianity, and in its talon are an olive branch of peace, and a sceptre. In the centre of the eagle is a shield. The shield itself is bi-colour, red and blue. On the shield is an aurochs head, a star, crescent, and a rose. All symbols of Moldova. Along with Saudi Arabia and Paraguay, Moldova is unique amongst nations, in that the obverse and reverse of the flag are different. The national crest is officially emblazoned on one side only! However, it is common to see flags with the crest printed on both sides. Though this does not follow official practise.